I’ve been thinking a lot about it this year. We never did much with Advent growing up. It was a word before “Calendar” and that meant cheap chocolate. That’s all I knew. It’s a time described as a time of waiting…or a time of hope… or a time of yielding or a time of preparation. In lots of circles it’s a time when we celebrate, or at least talk about those beautiful virtues of love, joy, hope, peace. And these are good things. Beautiful, glittery things. But there’s kind of more to Advent than I expected. Its deep and serious and mostly has us dwell with characters like Isaiah and John the Baptist—and they aren’t glittery guys….But in this depth, could it offer something to those truly despairing….or those truly lost….or those whose longing threatens to overcome them….or those truly yanked out of the life they thought was theirs? Or to those just waiting….always waiting for God to make himself known….again and again? And I wonder if it could offer my anxiety or my own overwhelmedness at the state of the world and state of myself. 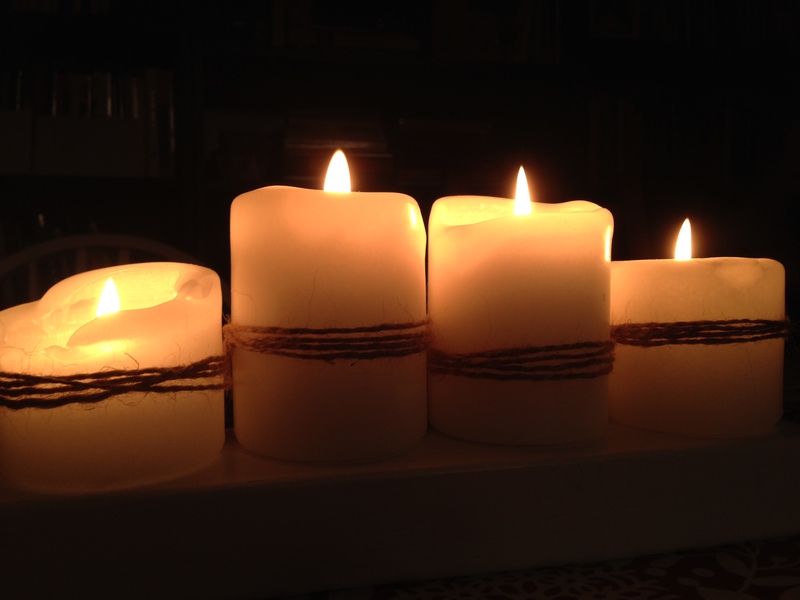 Advent, when we let it, can become more than a pleasant road to a nice finish, a comforting destination. It can be a door, through which we enter and practice entering the always anew-ness of the deep life of God. It can have us knowing Christmas to not just be a nicely wrapped answer but always a question, a hard-to-digest question—How can this be? How can this be? God what are you doing? How can this be? And his promised answer is unexpected, and a bit upside-down but somehow always on the mark. Advent does this for me when I start listening carefully to this season’s scriptures. When I let the lectionary readings stand over me, speaking what they may, in a contemplative sense rather than an informational and analyzing sense. I found a depth of meaning in those OT scriptures that I never had before when I always approached them from a “standing over” position–trying to reach in and grab my point, my lesson, my proof. These scriptures have this sense—not just of a Christmastime “hope” but of a deep and prophetic longing—that longing and waiting that speaks to our innermost selves and what we need of God and also somehow speaks to the world. And then these scriptures also are about offering or yielding or preparing a place for that longing to grow and then pour out of. So when we look at the the first week of Advent, it is all about Crying for God to Come. The Scripture readings center around God’s people, CRYING out for God to appear decisively—Scriptures like Isaiah 64 which cry for God to tear open the Heavens, or Psalm 80 where the people are crying out from exile, “restore us Lord”. There is deep pain, the knowledge of deep injustice and yes, even desperation for God to show himself that is not in any way lost on us today. In the Second week of Advent, the scriptures all talk about GETTING READY for God to come—Isaiah 40, a voice is to cry out “Prepare God’s Way” and then in the gospel of Mark with John the Baptist so roughly and unequivocally calling for repentance, for baptism for the forgiveness of our sins and for getting ready for the Kingdom coming. Its such an honest preparing, baring of ourselves to get ready for God to come that the scriptures call us to. Then on the third Sunday of Advent we are promised the Good News. The nature of this news is being fleshed out in these scriptures. Is. 61 talks about the Spirit of the Lord anointing a prophet who will bring Good News to the oppressed, the Psalm this Sunday is one of Ascent that the pilgrims would sing , returning from exile on the way to the rebuilt temple. And the gospel reading this week is John the Baptist who is pointing to a new and radical kind of Good News—one that is not like himself…”there’s one coming….”— alluding to the fact that its not like anything they had seen. And then we come to the fourth Sunday of Advent. We read the annunciation and Mary’s Magnificat in Luke 1 and and the scriptures all make the point- the Good News is officially announced. And its announced….. to a girl. And moreover, its announced that this GOOD NEWS is coming THROUGH this girl and her baby. The promised end that all these scriptures have been pointing towards is shown to be a real, incarnated beginning—that is in fact–a human life. A small, vulnerable infant, completely dependant on another small girl who somehow made room within her for the BIGNESS of the fulfillment of ALL that deep pain and, deep preparing, deep longing that preceeded this new life. And this is the story that we get to live in during Advent. We can practice and can walk through the depth of longing, through that door into….well, into the weirdness of how God defies expectations. Continually. And thoroughly. How God picked a no name place and a no name girl in a quiet, hidden birth…..so unlauded, except for a few lowly laborers and eccentric outsiders. Its astounding…really. Why does God do it this way? This upside down way. It seems pointless, sometimes….Did it even work? Humankind is still awful, still desires power and control and meaning so desperately that we SLAUGHTER each other and strip eachother of humanity. We hurt eachother. Hard. All the time. We still don’t listen to those vulnerable voices. Those silent voices. But that’s who he told. That’s who responded to his ask. Think of Mary—the quiet, vulnerable voice calming a newborn. Think of your own deep longing, your own deep confusion. Your own deep terror and deep questions and deep weariness. Think of Mary as she’s told of this promise. Think of your own desire to love and to be loved, to know people and be important to others and when that just doesn’t seem to be enough. Think of when you don’t understand what’s going on and you don’t understand yourself. Think of Mary as she was deeply disturbed by this news….. Think of how you long to hope beyond hope that you are ok, and that we are ok, and that God is there and that he is THERE. Oh Mary, you who let the preparation for the weirdest-good-news-ever happen deep in your hidden self. Where no one would ever believe you. No one except some dirty workers and a few strange smart guys and another woman, old and passed over most of her life. She got it. Oh God, you who breaks through in the strangest of times, in the quietest of places, in the most overlooked travails. Think of Mary as she is portrayed centuries later….calm, knowing, mourning, loving eyes above a heart surrounded by roses, fire and lilies—the bloom of death. She bares her heart, beating and broken. She knows how God answered a promise—in hard, good, terrifying, sustaining ways. Or how she is sometimes portrayed holding a church….broken heart pouring out while containing and loving that unwieldy thing we can sometimes handle and sometimes not. O secret seed, O hidden spring of light. And make a womb of all this wounded world. And make these rags of time our swaddling bands. I had a dear friend lose her father tragically a few weeks before Christmas last year. As she entered the Advent season she would post on her social media pages with the tag #nowwewaitindarkness as well as with the tag #nowweheadintothelight. As she mourned and wound her way through an unknown and unwanted land she found these words, these very advent words to bring….hope …and a path. Advent is the time we wait, we practice waiting, we pay attention to the longing in the dark we live through. And we look for those moments in which we see the light, are drawn to it and move towards it. Merry Christmas my dear friends. May you be honored and blessed by Good News breaking in somewhere, in the strangest of places. —-note—-A lot of my thinking about Advent began and was shaped by the sermons of Rev. Ed Searcy of Vancouver. His is the little church we found ourselves in when Brad and I started needing a little church. He writes and talks a lot about the Seasons of the Church and has given me an immeasurable gift of seeing my Christian life through the lens of the Christian Seasons of Advent, Christmas, Epiphany, Lent, Easter, and Ordinary Time. You can find his blog here.